The Alameda County Firefighters Annual 4th of July Pancake Breakfast, co-sponsored by Newark IHOP is on Wednesday, July 4, 2018 at Alameda County Fire Department Station 27 (39039 Cherry Street, or Cherry Street at Mowry Avenue) in Newark from 8AM-11AM. 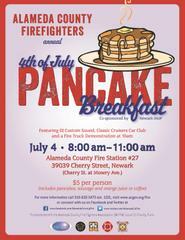 For a $5 donation, enjoy pancakes, sausage, coffee and/or orange juice and help support the Alameda County Fire Fighters Association Charity Fund. The event will also feature music by DJ Custom Sound, the Classic Cruisers Car Club and a Fire Truck Demonstration at 10AM.